Define set of tasks for the User Story and update status tasks status to progress towards the completion of User Story. Assign resource to Task and User Story. There are two ways to add Tasks to the User Story. 1. Go to Scrum Board. 2. Click on Add Task to add a Task for the User Story. 3. Provide Task details to create a detail task. The task can also be added from the Edit User Story. 2. Open Task Tab of User Story. 3. 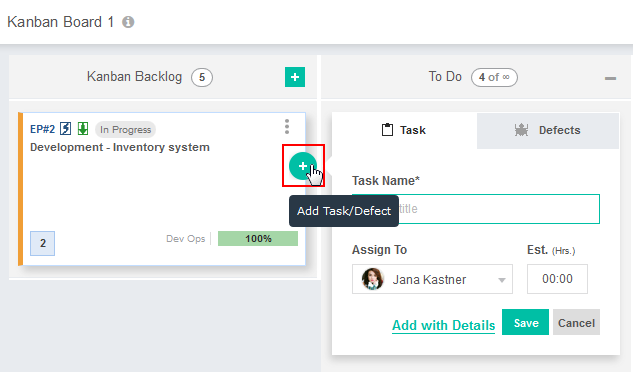 Click on Add Task/ Defect button, to add a Task or a Defect in a User Story. Use Add Task/ Defect to add task or defect task within a User Story. Efforts estimated for the Task in hours. Move User Story under Archive section once all the tasks of the story are completed.